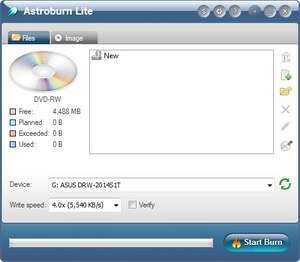 If you're looking for an application which can quickly burn a blu-ray, CD or DVD disc, Astroburn Lite is a perfect place to start. It is a freeware application developed by the same people behind Daemon Tools. The graphical user interface of Astroburn Lite is quite easy to use and actually perform the task of burning a blu-ray involves a simple step process: Start the program, insert a blank disc in to your burner, select the data or image you would like to burn to a disc and click the start button. Within minutes, your completed disc is ready. For security reasons, you should also check out the Astroburn Lite download at LO4D.com which includes virus and malware tests. Additional screenshots of this application download may be available, too. Astroburn Lite has a presence on social networks. Astroburn Lite download been highly rated by our users.